“Life can only be understood backwards; but it must be lived forwards. It may seem odd that we’re mulling over the words of a 19th century Danish philosopher and theologian as we move into a brand new year, but they’re worth sharing. It’s always good to have a quick look back before we lurch forward. These twelve excerpts from the past year highlight what Kitchissippi was all about, what defined and connected us, and perhaps they will help guide our future together as we move into a new year. As always, we love to hear from our readers. What would you like to see more of in 2014? What kind of community should we strive to become as we “live forwards”? Send your thoughts to editor@kitchissippi.com. Don’t forget to include your full name and contact information. Well over one hundred parents attended the Ottawa Carleton District School Board’s Near West Accommodation Review meeting on January 23 at Fisher Park PS. “Imagine yourself living inside your fireplace,” says Westboro’s Karen Secord, “with creosote dripping from the ceiling in a hut with no running water, no windows and a dirt floor.” This is the state of homes Secord has visited in Guatemala. Westfest is celebrating its 10th anniversary this year, running from June 6-9 inclusive. Great things await the approximately one hundred thousand people who typically attend Westfest each year. Pritchard, 33, is an associate producer with CBC Radio in Ottawa and an editor with local arts and culture website, Apartment613. 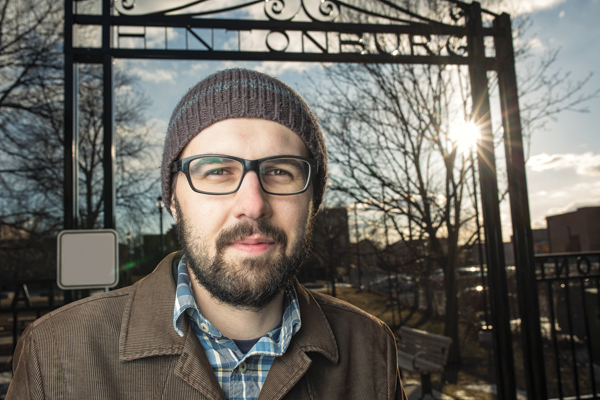 He is one of a dozen bloggers from Whitehorse to St. John’s who have been chosen to write about the changes and challenges facing the Canadian neighbourhoods they call home, in a new series entitled Hyperlocal launched on April 3. “We’re all telling stories about our neighborhoods, what’s changing, how things are evolving for the good or the worse,” says Pritchard, who has been keeping a close eye on the local scene for years. Hyperlocal is a five-week project to collect stories from all over Canada. Along with the twelve professional bloggers who will be submitting weekly stories, anyone can submit their story in the form of text, photos, audio or video. The goal is to spark a national conversation about our changing environment. Plans to redirect buses from the Transitway to Scott Street during light rail construction must address local area impacts, residents told organizers at an information night on June 18. “I think there’s a lot that we can learn about what works and what doesn’t work from studying the results of (Pierre Elliot) Trudeau’s career,” says West Wellington author, historian and policy consultant, Bob Plamondon. Popular yet controversial – just like its subject who is consistently ranked as both Canada’s most favourite and least favourite Canadian – The Truth about Trudeau has garnered Plamondon interviews in newspapers, on political shows across the country. Close to 400 athletes participated in the inaugural Wellington Mile race on Thanksgiving Monday, October 14. “The mile is historic,” said Samantha Calder-Sprackman, who was the first woman across the line in the first heat. She noted that it is a great distance for a community run as it brings together many levels of runners, from amateur to elite. These are just some of the threads that bind us together. There were many more stories that unfolded in 2013, and this list barely scratches the surface of the hundreds of articles about area development, local businesses, cultural events, and charitable causes. If you’d like to view all of the 2013 issues in one place, they are all archived right here.